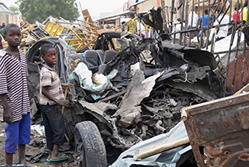 In its latest report, Curbing Violence in Nigeria (II): The Boko Haram Insurgency, the International Crisis Group examines the emergence, rise and evolution of a movement whose four-year insurgency has killed thousands, displaced close to a million, destroyed public infrastructure and weakened the country’s already poor economy, particularly in the North East. The government’s failure to provide security and basic services makes poor youth, in particular, an easy recruitment target for anti-state militias. As Boko Haram’s network expands into Cameroon and Niger, a military response is not enough. Only deep political and socio-economic reform can ease the injustices that fuel the insurgency. Boko Haram’s evolution since 2002 is strongly linked to failed governance, economic hardship, rising social inequality, corruption and impunity. Most Nigerians are poorer today than at independence in 1960. Poverty is most dire in the north, where Boko Haram, the latest of many northern fundamentalist movements, has tapped into Muslim revivalism and hopes to establish an Islamic state. Since 2010, the group’s campaign has grown, targeting not only security forces and politicians, but also civilians, traditional and religious leaders, public institutions, the UN presence and schools. It is more dispersed than ever, with many leaders in Cameroon and Niger, both of which are poorly equipped to address an armed Islamist threat. Boko Haram’s leader, Abubakar Shekau, seems to have little control over its factions, including Ansaru, which focuses on foreign targets. “Boko Haram’s insurgency is tapping into governance, corruption, impunity and underdevelopment grievances shared by most people in the region” says EJ Hogendoorn, Deputy Africa Program Director. “It’s a serious challenge and a manifestation of more profound threats to Nigeria’s security. Yet, the government’s response is largely military”. “Radical reform of governance and political culture is a big agenda, one some Nigerian elites have not yet demonstrated they have the will to address”, says Comfort Ero, Africa Program Director. “But if they do not, Boko Haram, or groups like it, will continue to destabilise large parts of the country”.